Home/ Blog/ What is The Olympic Gold Medal Made of? What is The Olympic Gold Medal Made of? We were surprised to find out that the Olympic gold medal is actually not so golden. It seems the glory of victory is wearing a little thin – the much coveted Olympic gold medal is not so Olympian in its gold content. In fact it’s not really made of gold at all. Kennecott Utah Copper, who provided the metal (and perhaps the mettle?) for all 4,700 medals for the Olympics occurring this year in London, revealed that all that glitters isn’t gold but is actually silver – 92.5% silver to be exact. The actual gold content is a very diminutive 1.34%! The remaining several percent is composed of copper. In second place, the silver medal is composed of 92.5% silver and 7.5% copper, and in last place the bronze medal is composed of 97 % copper, 2.5 % zinc, and 0.5% tin. The difference in value of all the medals is quite significant – the gold is estimated to be worth around the $494 mark, the silver around $260 and the bronze a meager $3! Having said that, if the Olympic gold medals were to contain more gold, they would be heavier and cost organisers tens of millions, so prudence seems to be the true victor in this contest! The Olympic medals for London 2012. Image via Top News. Thankfully we have a little more gold than that in our gold wedding and engagement rings! 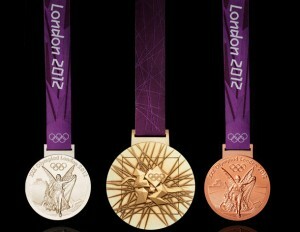 What do you think about the Olympic gold medal being only composed of little over 1% gold? Do you think it takes the shine off the glory of winning or do you think it’s the spirit of participation and achievement that counts? Tell us your thoughts in the comments below or talk to us on Facebook or Twitter.